If you are looking for a lightweight media player that couples capability with a tiny footprint, lightmusic can be choices that you may wish to take a look at. 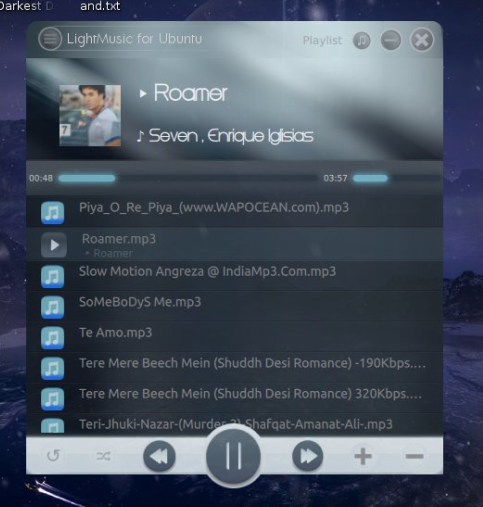 LightMusic comes with interface that is clean and intuitive, since Music Player is almost done using QML it runs with tiny footprint on your system. LightMusic is quick to launch and keeps memory usage fairly low. Depending on how many songs you load into its library, the RAM requirements can hover close to the 75 MB cutoff that I use as one of the criteria for lightweight. Its a beta version of app and we are working hard to bring all essential features as soon as possible.